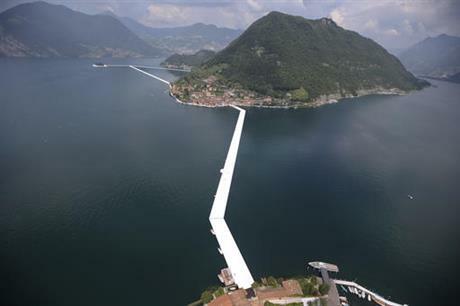 ISEO, Italy (AP) — It's taken nearly 2,000 years, but regular folks will soon get to feel what it is like to walk on water thanks to a project by the artist Christo, who may or may not have had his namesake in mind when envisioning his latest project: "The Floating Piers." "Any interpretation is legitimate," Christo, 80, allowed graciously in an interview Tuesday with The Associated Press at the picturesque Lake Iseo in northern Italy where his 23rd large-scale installation is just a week and a half from opening. Since November, Christo and his team have been overseeing the assembly and anchoring of 220,000 floating poly-ethylene cubes to create a 3-kilometer (nearly 2-mile) undulating runway connecting the mainland with a pair of islands, one inhabited and towering above the lake. 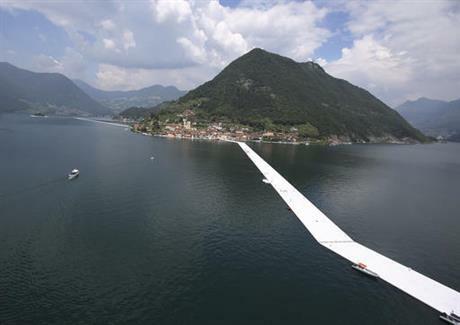 "For the first time, for 16 days, from the 18th of June to July 3, they will walk on the water," Christo said of the 2,000 residents of Monte Isolo, which is normally only accessible by boat. "The Floating Piers" is expected to draw half a million visitors during the longest days of the year to northern Italy's least-known big lake. That is considerably fewer than the 5 million who visited Christo's and his late wife Jeanne-Claude's famous "Wrapped Reichstag" in Berlin in 1995 and the 2 million who walked through their work "The Gates" in New York City's Central Park in 2005, due largely to the relatively rural location. The project still awaits a final touch: The application of deep yellow fabric that the artist promises will dramatically shift from nearly red to brilliant gold under the effects of light and humidity. "You will need sunscreen," from the reflection, he says with conviction. The project awakens many metaphors: Yellow brick road, for the fantastical journey it beckons. Runway, for the attention it commands. Beach for the lapping waves along the sloping edges of the 16-meter (more than 50-foot) wide boulevard. The fabric, which will be sewn into place by German seamstresses with specially made sewing machines, to create natural ruching. This effect prompts Christo to warn that visitors will have to step carefully along the oscillating platform. Once the installation opens on June 18, 150 volunteers, among them lifeguards, will be posted on the piers and on boats around the clock to ensure safety. Swimming is forbidden -- but expected, despite the cold water temperatures. Entrance is free, with the entire cost of the 15 million euro ($17 million) project financed by the artist himself. Christo's projects are as much feats of engineering as they are works of art. He has brought in a team of athletes from his native Bulgaria to assemble the specially made, recently invented cubes and divers to anchor them to concrete slabs on the lake-floor, employing oil-rig-inspired two-week rotations. The 190 anchors were moved into place by air balloons. Like many of his previous installations, "The Floating Piers," had its own destiny. Christo and Jeanne-Claude, who died in 2009, originally envisioned it for the delta of Rio de la Plata, Argentina, in 1970 but they failed to get permissions. They then considered Tokyo Bay, but again failed to get the permits. "The project is done for ourselves. And if other people like it, it's almost a bonus, very much like a painter who (has) huge big canvases they like to fill it with color. You don't fill the canvas with color to please Mr. Smith, Mr. Jones, you fill it with color because you like to have the joy to see this color," Christo said. When his 80th birthday was bearing down on him and his "Over the River" proposal to drape fabric over the Arkansas River in southern Colorado was still embroiled in court battles, Christo decided to make another run at "The Floating Piers." He chose Lake Iseo for its calm waters and simple shoreline against the majestic Alpine foothills that some believe may have inspired the background of Leonardo's "Mona Lisa." Christo suggests the hypothesis is made believable by the misty effect created by the lake climate, softening the mountain contours. In a painterly gesture, he said he made sure that the project offered vistas not only of the mountains, but also of the lake's medieval towns and verdant flora. "I don't like to talk on the telephone, I like to see the real people. And of course I don't understand anything of computers. I like to have the real things, the real water, the real sun, the real kilometer, the real wind, the real fear, the real joy," he said. Christo delighted in the gentle movement of the nearly finished project. He instructed a boat driver to circle past the runway to create waves and smiled gleefully at the gentile oscillation of the platform. Had the original project gone through, it would have been built with stodgier pontoons, lacking the kinetic grace allowed by the recently invented cubes. "Each project finds his right place," he said.